Free download the best 4K to HD converter, and then convert/compress (GoPro/iPhone) 4K UHD video to HD one on Windows/macOS for playback everywhere. 4K Ultra HD video has as much as 4 times the resolution of HD content, offering a higher dynamic range and more clear picture. Playing/Watching 4K movie on 4K display screen is so exciting experience. Apple even launched 21.5 inch iMac with Retina 4K display after previous 5K iMac. 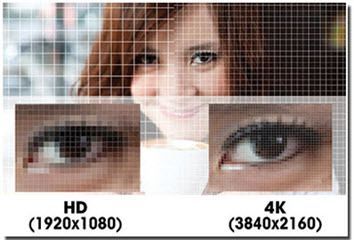 You have to know that playing 1080p HD videos on 4K (with high dpi) screen can deliver you clear image quality no obvious pixel block at all. However, watching 4K video on HD TV/monitor will surely disappoint you, then you just need a 4K to HD Converter software for 4K video compression first. - Compress (GoPro/iPhone/DJI recorded) 4K to 1080p/720p HD or other resolution for playback smoothly. - Transfer 4K footage taken by JVC/Sony/Panasonic/Canon or other cams to HD for better watching. Sony Pictures Entertainment has announced on Nov. 10 that its 4K Ultra HD discs will go on sale in "early 2016." From the catalog, we can see many famed movies will be made the leap to 4K in the first batch, such as Amazing Spider-Man 2, Hancock, Chappie, Salt, The Smurfs 2 and Pineapple Express. Moreover, some newer blockbusters and classics will be restored to be offered on 4K later, for example Captain Philips, Fury, Ghostbusters, The Fifth Element and Bad Boys. Actually, it's not Sony Pictures that create 4K movie for home viewing, but 20th Fox Century, who decided to make High Dynamic Range (HDR) UHD version of its works, X-Men: Days of Future Past and The Maze Runner included. The 4K content movie videos are becoming more and more at the online streaming services. YouTube, Vimeo, Dailymotion, Netflix, and Amazon Instant video added 4K video supporting one by one. Until then, to watch those 4K films at home, you must upgrade your screen to 4K HDTV/monitor, like Samsung 4K curved TV. Not only the purchased 4K movies can be put on the bigger and more clear screen, but also some recorded 4K video by 4K camera or brand-new smart devices e.g. iPhone Xs (Max)/XR, 8/7/6 (Plus)7/7 Plus, Galaxy Note S9/Note 9,can be moved to the 4K display screen. There are piles of (HD) video converter software in the market, but many are not featuring converting 4K or even 8K UHD videos for not having H.265 codec. 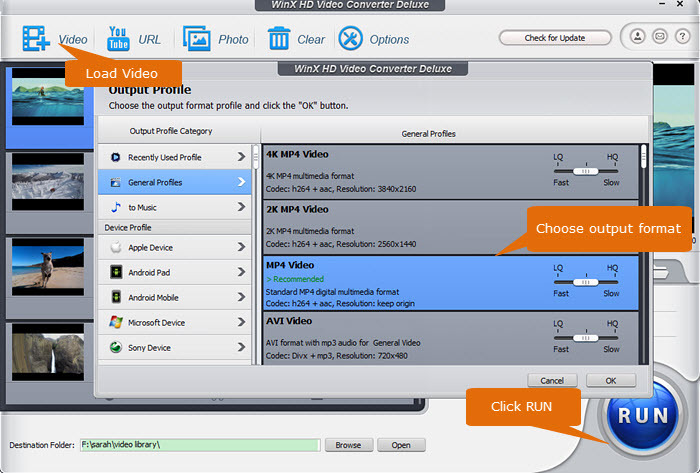 Here the tool we shared is a video converter that fully supports compressing 4K/2160p (to HD/SD) videos, that's WinX HD Video Converter Deluxe. What's worth to be mentioned is that this 4K (to HD) converter is recently updated with the hardware acceleration (both CPU and GPU acceleration techs included) to deliver a blazing fast video converting speed. Now Let's get to know how to use the 4K to HD converter. Step 1: Free download WinX 4K to HD Converter on your Windows PC (Mac version download), and double-click the .exe(or .dmg) to install it with seconds. Done, launch it to go to the next step. Step 2: Click "Video" function button on the main UI to enter into another control. Then input 4K video by clicking "+ Video" icon or directly dragging it to the software. Here you can choose an output video format, e.g. MP4 H.264, or from the "Video" section or "Target Format" list. After that click "coded / Option" icon on the interface to define an HD resolution as you prefer or need, such as 1080p and 720p. ▶ If necessary, you can edit video by cutting, cropping, rotating, adding filter effect/watermark/subtitles to video, and changing playback speed (10x slower ~ 16x faster). WinX HD Video Converter Deluxe also provides a toolbox to deshake your 4K footage, remove background (wind) noise, merge multiple 4K video clips, split a large or long 4K video into several ones and do more funny and useful post production jobs. Step 4: Press "RUN" icon to have the 4K to HD converter run after everything is ready. You can tick "Use High Quality Engine" and "Deinterlacing" options to output the highest possible image quality. In addition, "Hardware Acceleration Engine" (if there is) will be ultilized by default to accelerate conversion speed. Better still, WinX HD Video Converter Deluxe also features converting 4K (MKV/MP4) to AVI, MOV, FLV, 3GP, MP3, Xbox, PS4 and Chromecast and free downloading online 4K videos from YouTube, Vimeo, Dailymotion. As an one-stop video processing software, it's preloaded with DVD ripper and video recorder too. Other 4K/H.265 Software Recommendation: At present, the most popular media players, browsers and operating system are gradually adopting H.265/HEVC codec, which will surly become one of the mainstream video codecs like H.264.